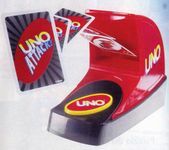 Mattel redesigned the card Launcher in 2005--removing the yellow handle and returning to the standard "UNO" logo on the side, rather than the large UNO graphic. The card backs also received a minor change with the addition of the "ATTACK!" logo; the faces remained otherwise unchanged.